Dave Underriner and his family. When Dave Underriner left Oregon State in 1981 with a forestry degree in hand, he never imagined he would one day manage 19,000 employees as Providence’s regional chief executive. His role isn’t too hard to imagine given he grew up in health care under the tutelage of a father who led Providence St. Vincent Medical Center, but as a young man he wanted to blaze his own trail – before the pull of impacting lives in a different way brought him back to his health care roots. “The work you do matters. You touch people in the most important way – their health. It’s not just a job,” says Dave, who started out as an administrative intern with Providence, a not-for-profit Catholic healthcare ministry, in 1981. Since then, he earned a master’s degree in health service administration from the University of Washington and has served Providence Oregon for over 30 years in advancing leadership roles. 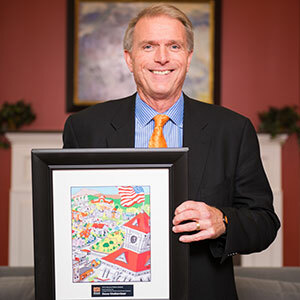 A 2015 Alumni Fellow representing the College of Public Health and Human Sciences, Dave is a recognized leader known for excellent and compassionate service. Service to others: He serves on the boards at the Oregon Association of Hospitals and Health Systems, Volunteers of America Oregon, Oregon Health Leadership Council, Health Share of Oregon, Oregon Business Council, and Our House of Portland, which provides services to people with HIV/AIDS. He is an honorary board member of Delta Society, an organization dedicated to improving health through the use of therapy and service animals, and is a former board member of the Portland Business Alliance, Trillium Family Services and Janus Youth Services. * The Triple Aim involves improving how patients experience care – including quality and satisfaction; improving the health of populations; and reducing the per capita cost of health care.